Kidney plant, Indian kidney tea, java tea, Kabling-parang, Mao xu cao, pokok misai kucing and Yaa-nuat-maeo. 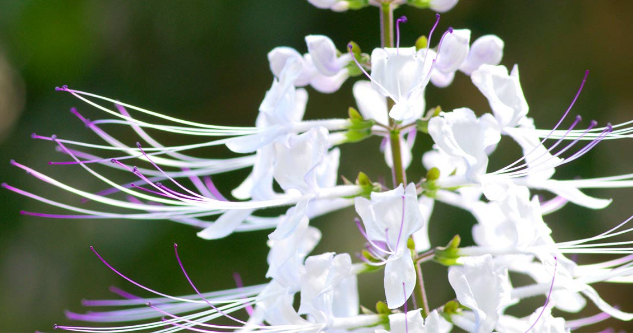 Cat’s whiskers is a herbal plan that looks like cats whiskers of all things, hence the name. It is grown in southeast Asian countries like China, Thailand, Taiwan, and Philippines. It contains – beta sitosterol, ursolic acid, hedargenin, glycolic acid, methylriparichromene A, bio flavonoids, oleanolic acid and potassium. Kidney Disorders – like kidney stones, infections, urinary tract infections and frequent urination as well as bladder stones. To make a j tea, use the fresh leaves with 4 cups of water to a cup of leaves. Boiling water, let cool for 10 mins then pour the water on the leaves and steep for 15 minutes. Use ½ cup of tea 3 x a day. Long term use can lead to low sodium levels in the body. Do not take during pregnancy. Avoid using if you are taking diuretic pills as this is a diuretic too.